The goal of this post is to set up a Visual Studio 2015 project with ASP NET Core 1 and Angular 2 Typescript that can be used as a template for all my projects. 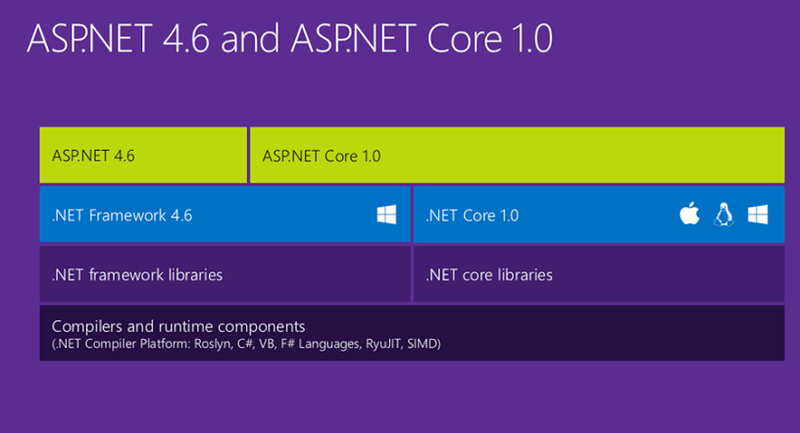 The former ASP.NET 5 was renamed to .NET Core 1. It is a modular Microsoft runtime library implementation that includes a subset of the .NET Framework. .NET Core 1 was written from scratch. It has a lot of advantages, for example it is lighter, open-source and multi-platform: Mac, Linux and Windows. Although the version 1 is in Release Candidate there are some ASP.NET 4.6 features missing, like SignalR. It is up to you to choose a mature Framework like ASP.NET 4.6 or a modern one like ASP.NET Core 1… you can read more about it in this post by Scott Hanselman. I copied the following diagram from that post :-). There are some problems in Windows using npm version 2. It nest dependencies and ends up having too long paths for Windows. Let’s start updating npm to version 3 and configuring Visual Studio to use it. The first thing that we should do is to install Python version 2.7.X and NodeJS version 4.2.X. Remember the path where you install NodeJS, we will need it later. The version should be higher than 3.X.X. 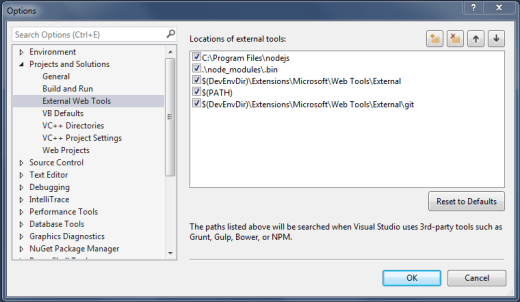 Open visual studio and add the path where NodeJS is installed as the first path to look for external tools (at the top). The next time that Visual Studio has to restore a node package it will start looking for nodejs.exe in that path. The version we just installed will be found and used. Let’s create our project and configure a very simple server-side code. In Visual Studio 2015 Update 1 ASP NET Core 1 is still called ASP NET 5. 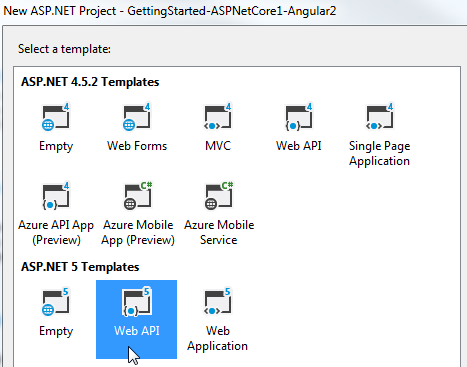 Create a new project and select the WebAPI template. Our project will have a SPA that will call a WebAPI controller to get a message. The file Startup.cs contains the configuration of the middleware. We will see in a future post how it works and how to configure it to use features like authentication. The default configuration when you select a WebAPI project template is ok for us. Our files will be part of the project… but this is an easy way to make Visual Studio auto transpile. Running typescript compiler in watch mode is an alternative… but I like this solution because I have everything integrated in Visual Studio. The application that we will use as an example will be a simple application that call the server to get a message and will display using Angular 2. 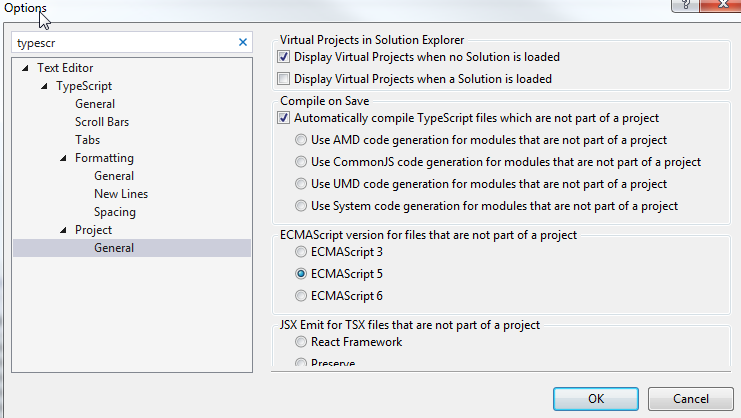 Save the file and Visual Studio will create node_modules folder and download all dependencies for you. It is out of the scope of this post to explain how Angular 2 works you can read more about it here. But basically we define a component that we can use in our index. This component is a html view that has bindings to its code behind or “view-model”. The hello.component uses the service hello.service that makes REST calls to the server and returns Observable<T>. We want to create our bundles automatically when we rebuild or clean the project (not in every build). This will trigger our tasks always that we clean or rebuild our solution. You can also add the bundle task to the “Before Build” event… but it can takes 8-10 seconds and normally the dependencies are not changing in every build. We have a pre-configured project that hopefully will save us some time in the future! If you know how to make it better please leave me a comment! Have fun with ASP.NET Core and Angular 2!